For his latest project, Seattle-based photographer Adrain Chesser spent the better part of six years roving the Western United States with a loosely banded tribe of modern American nomads. Here is some of what he saw. Working in collaboration with Native American ritualist Timothy White Eagle, Chesser set out in 2006 to document the lives of people living at the fringes of contemporary American society. 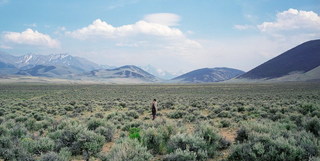 Photographs from his journey, recently collected in a photo book titled The Return, document the lives of a nomadic society as it travels with the seasons through the states of Washington, Idaho, Nevada, California, and Oregon. "Most are poor, some are queer, some are transgender, some are hermits, and some are politically radical," writes Timothy White Eagle. "All believe that major shifts are needed in the way modern society interacts with the natural world. These willing pioneers are stepping off into uncertain terrain, searching for something lost generations ago." "What I learned from making this project has been life altering," Chesser tells io9. "One of the principles that the subjects of The Return strive to live by is to give back more than you take. Personally, it has made me question all the ways in which I use energy, materials and resources," he says. A digital version of The Return that includes audio and video is also available here.